Creating a positive and fun environment is key to Spark Tennis. We must say that not all players will be a good fit for Spark drills, regardless of their level. Who is a great fit? Those players who maintain a positive attitude, engage in positive self-talk, encourage other players and exhibit great sportsmanship. Why is this so important? Well, frankly, environment is a key factor which influences growth and development. If your competitive juices are simply too strong to be nice, please check out “Where to Play Tennis” for other options. Please remember Spark drills are for fun and all players should be good sports & respectful to themselves and others players. Unnecessary outbursts, negativity or complaining will result in players sitting out an entire round and possibly disqualified from the drill. Remember: you are responsible only for your own effort and attitude. How much do Spark Drills Cost? $10/person. Scholarships can be awarded based on need, sportsmanship and other factors. 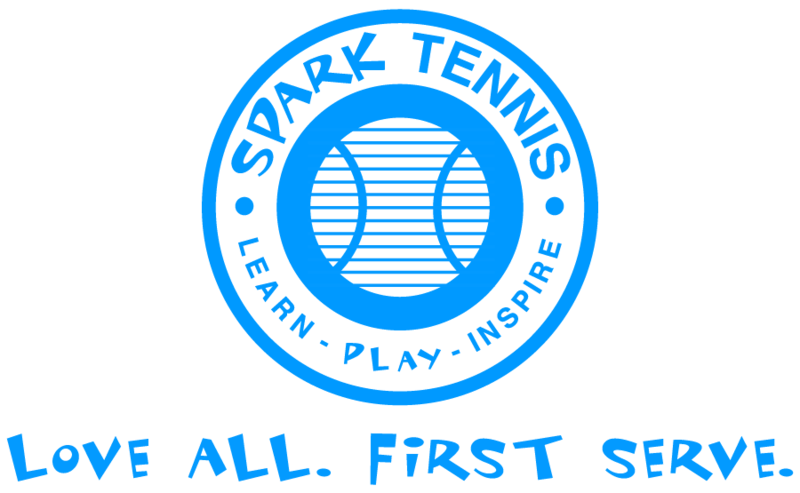 Spark Tennis provides the opportunity for players of all levels and ages to improve their tennis skills. Each Saturday, Spark Tennis offers a 1-hour session of group instruction where players can try out shots and receive immediate feedback for improvement. Spark Tennis focuses on the basics of coordination, footwork and generally accepted proper form and then welcomes players to explore their potential once a proper foundation has been built. We encourage players to attend our Spark Tennis Learn sessions regularly for continued improvement. Looking for more private instruction? Ask about private lessons! In order for your first shots off the feed to count, your ball must past the opponent’s service line before the second bounce. No dirty drop shots or short angle balls at the net from the feed. 🙂 Yes, we know how tempting this is… so, we’ll give you a second attempt if you forget (most times). This encourages the start of a rally, at which point, anything goes! So, save that drop shot or super short angle volley for the second shot or actual match play. At Spark Drills, we all want the chance to play. Spark Saturdays are dependent upon favorable weather since we play outdoors. In the case of bad weather (too cold, raining, too windy), we will send a message out to all players via Remind. Make sure you are connected so you will be informed of any changes, cancellations, or make-up drills. We encourage stretching and light warm-up exercises prior to the start of a drill. This helps each player get the most of out the drill session and helps ensure healthy movement. We expect all players to be kind and respectful, because that’s the Spark Tennis way of “Love All”. Please be a positive force on the court and have fun!